While working at Joslyn Art Museum in Omaha, one of Eugene Kingman's most noteworthy commissions was received in 1947, when he was invited by Mr. Arthur Sultzberger, Sr., CEO of the New York Times, to paint a large mural. Using his own skills with maps and murals and consulting with a cartographer, Kingman painted a vast and accurate view of the earth, a challenge since no one in the mid-1940s had ever seen what the earth looked like from space. He added a number of red dots on the map to mark important world cities, like New York, Paris, Tokyo and Omaha, his beloved home at the time. The mural was installed in the lobby of the New York Times building in 1948, and for the next forty years the art inspired generations of reporters, Times staff members and newsmakers who came to call at the venerable newspaper. The New York Times took down the mural during a lobby renovation in the late 1980s and after years in the Times archives, the mural was donated to the Joslyn Castle Trust in Omaha. After a community effort to get the mural back to Omaha spearheaded by Maureen McCann Waldron, it arrived in May 2014, and was restored at the Ford Conservancy Center in Omaha. At the publisher's request, Kingman added the lines of poetry, which remain timeless and uplifting: "Every day is a fresh beginning. Every morn is the world made new." 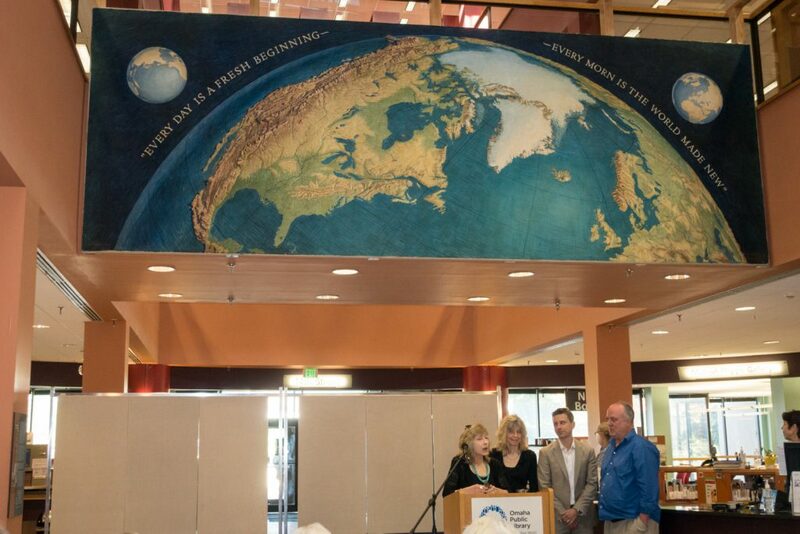 The Kingman/New York Times Mural was dedicated on June 16, 2016 at the Dale Clark Public Library in Omaha during a presentation by Maureen McCann Waldron. The Kingman daughters (Elizabeth Anne Kingman and Mixie Kingman Eddy), grandson, Quinlan Kingman Eddy, and nephew, Lou Kingman, were present.